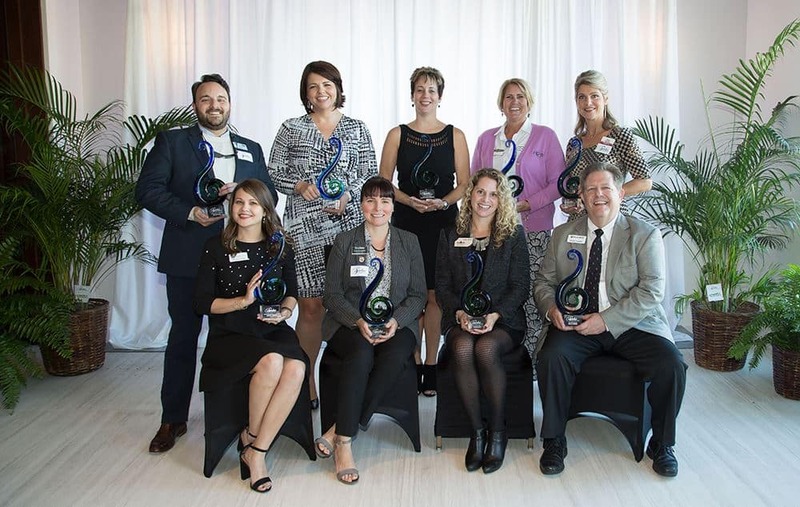 The Lakewood Ranch Business Alliance announced the 9 winners from the annual Sandies Members’ Choice Awards at its luncheon on Friday, November 16, at the Ballroom at Grove. Over 325 LWRBA members and guests were in attendance. The Sandies honor LWRBA volunteers who strive towards the highest levels of personal and professional accomplishment, devote time and energy to our community, and forge paths of leadership for others to follow. Winners were selected by their peers from a pool of 42 finalists across 8 categories through an online nomination and voting process. Named after the sandhill cranes that are a common sight in Lakewood Ranch, the Sandies honor outstanding leaders and volunteers for whom the alliance is incredibly grateful. This year our very own Erik Hanson won the Volunteer of the Year award for his “most extraordinary dedication and commitment” to the alliance. Erik M. Hanson joined Norton Hammersley in 2012 as an associate attorney and is a member of our trial practice and dispute-resolution group. Mr. Hanson’s practice focuses on civil litigation, including complex commercial litigation, contract disputes, construction litigation, real-estate litigation, and estate and trust disputes. Before joining Norton, Hammersley, Lopez, & Skokos, P.A., Mr. Hanson was a clerk at three insurance defense firms in the Southwest Florida area, specializing in premises liability, construction litigation, and malpractice defense. While in law school, Mr. Hanson was a senior associate on the Stetson Law Review, which published more than fifteen of Mr. Hanson’s case digests summarizing Florida appellate decisions on issues ranging from construction licensing to governmental tort liability.